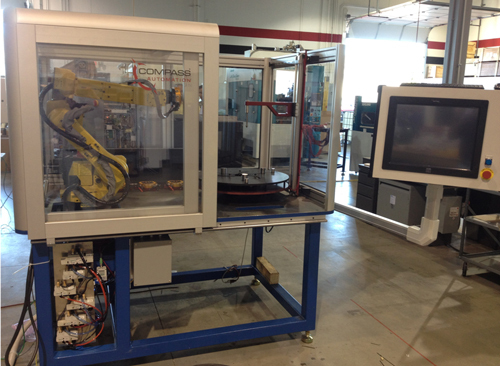 Compass Automation has rapidly become an industry-leading provider of custom robotic deburring systems. In the fall of 2012 Compass completed the project highlighted below for Fairfield Manufacturing Company, providing an automated gear deburring system. Compass was able to provide Fairfield Manufacturing with an outstanding product in an extremely tight timeline. This system drastically simplifies the deburring process by giving Fairfield the capability to automatically deburr a wide range of gears safely and efficiently. Fairfield Manufacturing Company is a worldwide leader in design, manufacturing and supply of gears, gear drives, custom gear assemblies for mobile and industrial machinery. With manufacturing capabilities in the United States, India and China, Fairfield offers custom gears with spur, helical or bevel forms from 20mm through 2M to AGMA Class 14 standards. Fairfield is part of Oerlikon AG, a global technology company with over 16,000 employees in 36 countries. With the automotive and industrial machine industries rebounding, Fairfield projected their volumes to grow significantly throughout 2012. In order to avoid bottlenecks in the gear manufacturing process, Fairfield needed to make some capital expenditures to ensure they had the bandwidth to take on the new business. Fairfield Manufacturing produces a wide variety of gear types, shapes and sizes. This range was causing a bottleneck in their deburring process because of the set-up time needed to go from part to part with the outdated machines they had on their floor. They needed a deburring machine that would be able to switch from gear type “A” to gear type “B” as quickly and easily as possible. 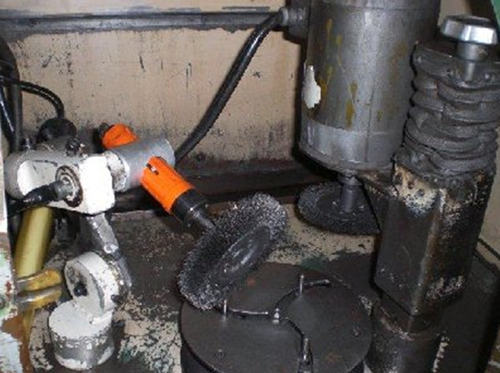 Figure 1 - Existing Deburring Equipment: The deburring performed by Compass Automation’s Robotic Deburring System was being done manually or by outdated “simple” deburring machines prior to installation. Manual deburring can be a dangerous and tedious job with mistakes and inconsistent finishes as a side-effect. “Simple” Gear Deburring Machines require an operator to set-up the tooling every time a new gear needs to be deburred (shown above). 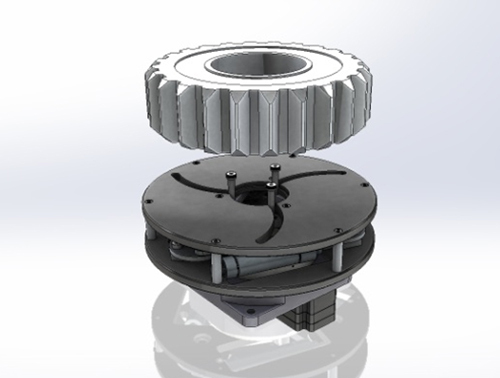 The custom workholding chuck engineered by Compass allows the operator to load a wide range of gears into the system. The enclosure is designed to accommodate heavier parts that may need an overhead crane to lift. The system was built to handle any gear with an OD up to 26 inches. 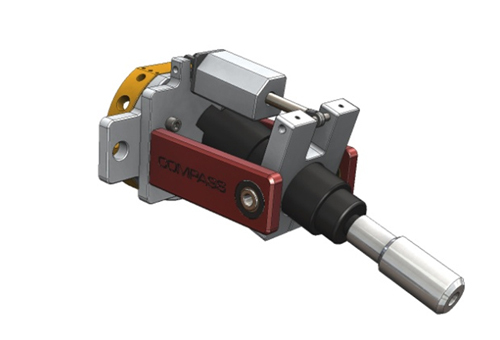 Figure 2: A rendering of Compass Automation’s adjustable long-stroke chuck. After the chuck jaws are actuated by the operator via the HMI, the three jaws automatically center the gear on the workholding piece. The gear shown has an outside diameter of 26 inches which is the maximum diameter that will be run on this system. After the gear has been loaded into the machine, the operator will select the appropriate program from the “Part Program List” on the HMI. The touch screen interface has the capability to store up to 1000 different part recipes, as well as the ability to back the programs up onto a local network via Ethernet. Once the correct part program has been selected, the Run Screen will appear on the HMI. After the operator confirms that the correct program is selected, he will hit run and the deburring cycle will begin. To program a new part, an operator must first select which tool he would like to deburr with. 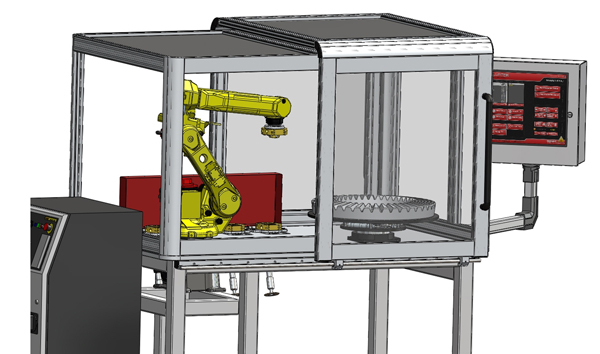 Once the tool is selected, he moves the robot into a desired deburring position using the X, Y, Z, W, P, R buttons which represent the 6 axes of the industrial robot (see figure 3). After the robot has been moved into position, the operator records the deburring position and selects the peripheral options to complete the Part Program. The additional options include tool pressure, table rotation speed, table direction, and spindle rotation direction. The part recipe is now complete and can be saved into the Part Database. 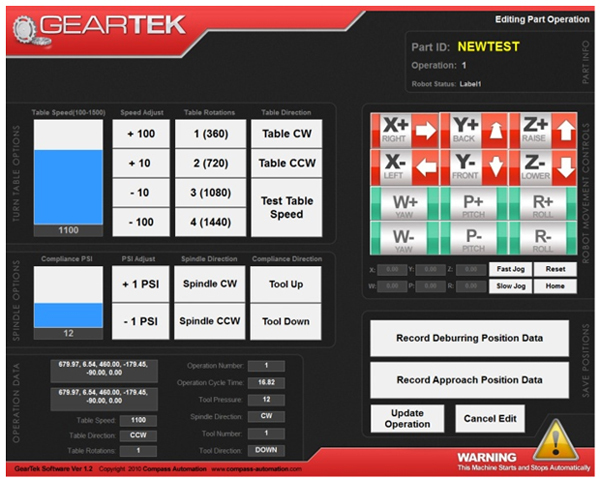 Figure 3: A screen shot of the “New Part Screen” on the system’s touch screen HMI. Part Programs can be created by moving the robot with the X, Y, Z, W, P, R buttons on the top right of the HMI. Once the operator feels like the deburring position is correct, he may hit the “Record Deburring Position” and save the part in the Part Program Database. The tooling designed by Compass Automation allowed Fairfield to use combinations of different deburring media to achieve the required surface finish. The radially compliant tooling with quick change spindles can accommodate a large range of abrasive wheels, brushes, and other specialty deburring media. The compliance force is driven by a pneumatic cylinder and the force is adjustable via the touch screen, inside the recipe setup. The tool is shown below. Figure 4: An engineered model of Compass Automation’s compliant tooling. The tool uses digitally regulated air pressure to control the aggressiveness of the deburring. The tools have a capability to be automatically changed because they are equipped with an ATI Tool Changing System. After the deburring cycle is complete, the operator can choose an option on the HMI to have the robot automatically clean the part. After the clean cycle, the operator simply opens the sliding door and unloads the part. Safety interlock features ensure that the robot is faulted when the door is opened. Ultimately, the system delivered by Compass made it possible for Fairfield Manufacturing to eliminate an unnecessary bottleneck in their deburring process. The system is being used during all three shifts of the workday and has successfully deburred over 300 different parts. The custom software has stored all of the part recipes and can be instantly recalled when that part is run in the future. The Finished System: Compass completed the design, build, programming, and integration of this system in 16 weeks. Compass designs, develops and integrates custom automation systems that help manufacturers optimize their production.